TODAY nutrition expert Joy Bauer has been cooking up healthy recipes and easy ingredient swap ideas for years. But the busy author and host will tell you that her most fulfilling role is being a mom of three. 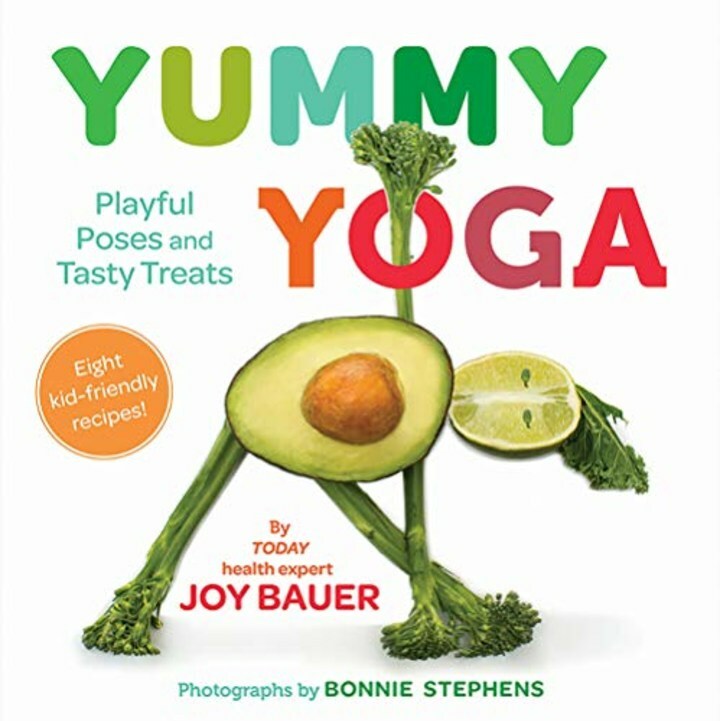 This fall, Joy will be sharing two of her favorite things — nutritious meals that are also delicious and getting active — with the release of her first children's book, "Yummy Yoga: Playful Poses and Tasty Treats." "Yummy Yoga: Playful Poses and Tasty Treats"
"As a mom of three children (now grown!) and an aunt to 12 nieces and nephews who all live nearby, I'm used to cooking for a big crowd of young kiddos," Joy, who once served as the Director of Nutrition and Fitness for the Department of Pediatric Cardiology at Mount Sinai Medical Center, told TODAY. "I know what they like — and, through years of practice, I've learned how to get them to eat things they think they don't like. It's so fun and fulfilling to watch their faces light up when they try — and enjoy — a new food." The same goes for trying a new exercise, too. "Yummy Yoga" displays kids demonstrating basic yoga poses while their fruit-and-veggie counterparts showcase the same pose. Each pose is accompanied by a simple recipe featuring the ingredients in the photo. Many of the recipes were created to make sure that little helpers can assist in the kitchen, too. It's never too early to start teaching kids healthy habits, as long as it's done "in a positive and entertaining manner," said Joy, who also stars in her own TODAY Food original series "Joy Full Eats." By showcasing fresh produce and healthy ingredients in a fun way, Joy hopes that both kids and parents will be engaged in the food-prep process. Recipes include Broccomole (guacamole with an extra hit of nutrition from broccoli), Super Skewer Fruit Kebabs and icy Power Pops. "The goal is to focus on what kids should be eating versus vilifying what they shouldn't be eating," said Joy. "Keep things positive and upbeat — it's so much more appealing to kids that way." When she was raising her kids, Joy not only incorporated different themes into weeknight meals, but also made sure that they were involved in menu planning and meal prep to keep them engaged in the entire process. With this new book, she hopes to be able to showcase how easy it can be to start building healthy habits early. "This is truly the age when life-long habits start to develop," said Joy. "It's such a simple message: Healthy eating and exercise go hand in hand when it comes to living our best life."